So, we had a baby over the weekend =). 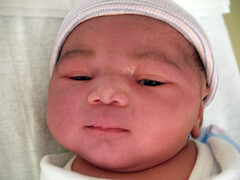 8 lbs 10 ounces, 3 1/2 hour labor @ Hillcrest hospital (where Chika was born as well). Her name is Anyachiemeka Chibuzo Anastar Ogbuji. I've created a flickr set for her pictures. This particular shot (to the left) is my favourite. I'm getting much better with my Olympus 300 e-volt. In particular I'm now able to anticipate the settings to use before taking any practice shots. Roschelle's mom asked me how it felt to be a father of 3 and I told her it feels less different everytime. But nevertheless, that doesn't make it any less of a miracle. Lori did her amazingly quick labor miracle thingie and brought the new boy into the world at our home at 21:16, Monday, 25 July, 2005. (It was a planned home birth, expert midwife in attendance, and all that). We haven't named him yet, in part because we had hoped for a girl and really didn't give the other 50% contingency much thought, and partly because I, and surprisingly Lori, tend towards the Igbo tradition of waiting to meet the little one before you burden him with a life-long name (Jide wasn't named until a few days after his birth). 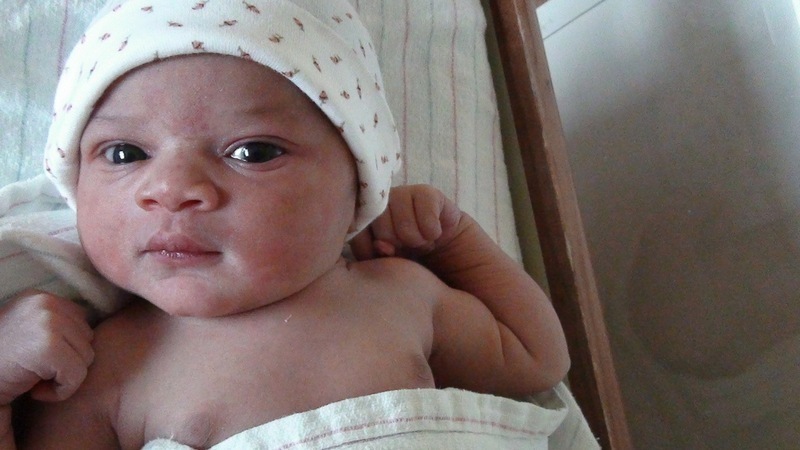 Update: he is Udoka Julian Melayo Ogbuji. Mother and child are doing quite well. 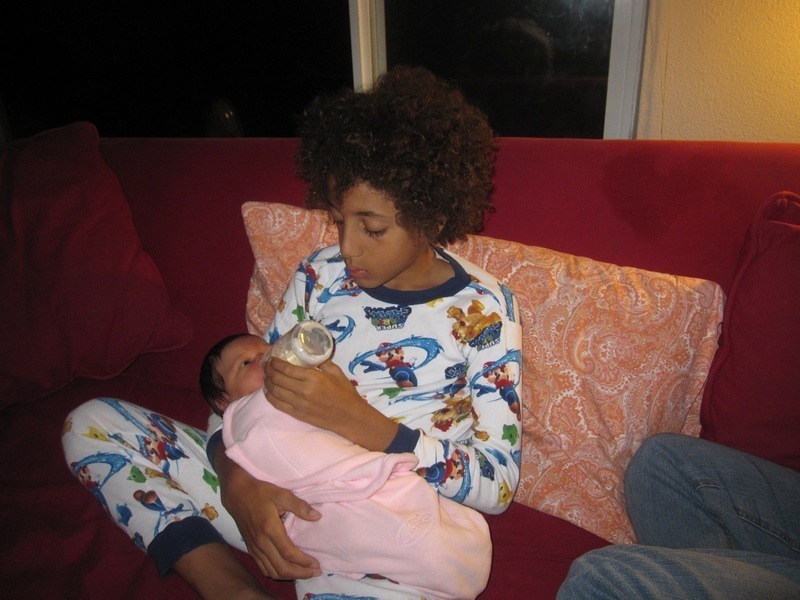 Eldest boy Osita is very excited to have another baby brother, and middle son Jide is largely concerned with his own affairs (we do have a few pictures of him playing with his new brother). I appear to be continuing evidence of the Ogbuji Y chromosome entrenchment: My parents had three children, all boys, and now they have 5 grandchildren, all boys. But putting my three sons side by side, I find quite marvelous in fact what Lori and I had considered scary in imagination. We are most emphatically not trading this batch in, least of all the newest household terror. More pictures on my Flickr photo stream. 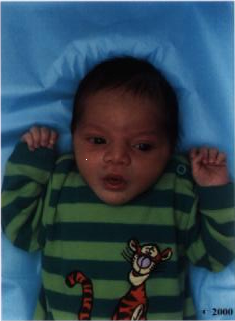 Jideobi Maxwell Dike Ogbuji was born at home at 12:13 on 28 August 2002 weighing 8lb 8oz and 20 3/4 inches long. Jideobi "ji-doh'-bee" (sounds somewhat like "adobe") is an Igbo name. It can be shortened to Jide (jih-day, almost like Aussie "g'day"). It has a manifold meaning, depending on the exact pronunciation used. In one form (rising tone on "bi"), it means "one who holds the family, clan or household together". In the other form (descending tone on "bi"), it means "one who holds the heart"). We have chosen to use both pronounciations and thus meanings. Dike is another Igbo name meaning "strong one" or "honored one". Jideobi is our second son, after Ositadimma. 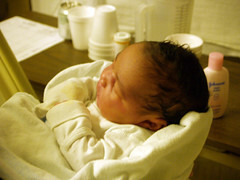 Ositadimma Nigel Ogbuji, our first child, a boy, was born at 9:43 a.m. on the tenth of February, 2000, weighing 7 lbs. 4 oz. and 19 and 3/4 inches in length. Ositadimma (commonly "Osita", or even just "Osi") is Igbo for "things will be good from now on." "Osita" is, of course, not to be confused with Spanish for "teddy bear". "Nigel" comes from Latin for "dark" and "Ogbuji" is Igbo for "yam farmer", approximately. So it seems one could translate as "a brilliant start for the dark yam farmer".